Due to the fact that I have lost my camera I had to take these once the blanket was finished. Also I had to use my old camera which decided to be grumpy (presumably it felt neglected) and refused to focus properly (so sorry for the bad photos). This square is a simple granny square with the last two round done in dc (UK terminology) to give it a bit of added stability. I love these three colours together and think they look really pretty. I decided at this point that it was going to be a girlie blanket. This square is my salute to Spring (it’s just round the corner people, I promise!). Part of my reason for doing this was to learn different techniques and effects so that I can be more versatile in the future. The decision to do two different colours of yellow was completely inspired by my love of daffodils (a spring favourite in this house) and had nothing at all to do with the fact that I ran out of the first yellow yarn (I haven’t convinced you have I?!). 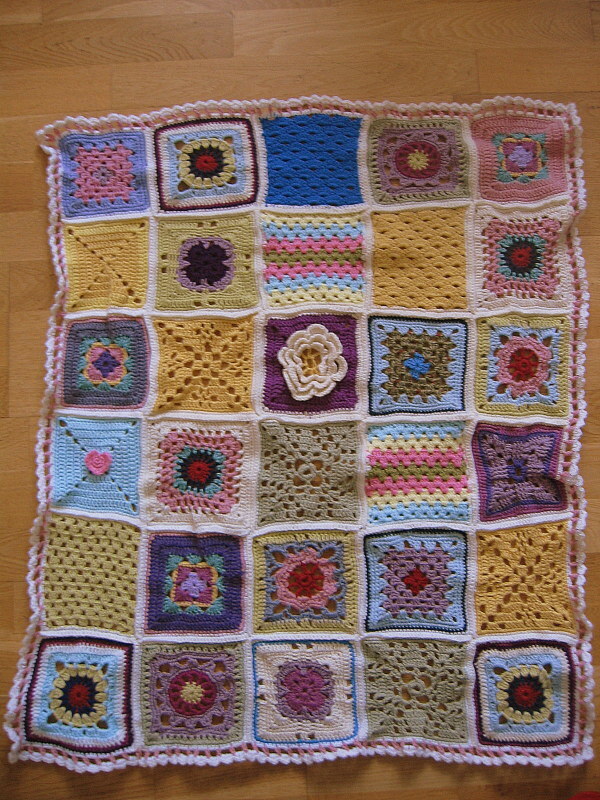 This square was one that I had done previously and enjoyed so I thought I would add another one. 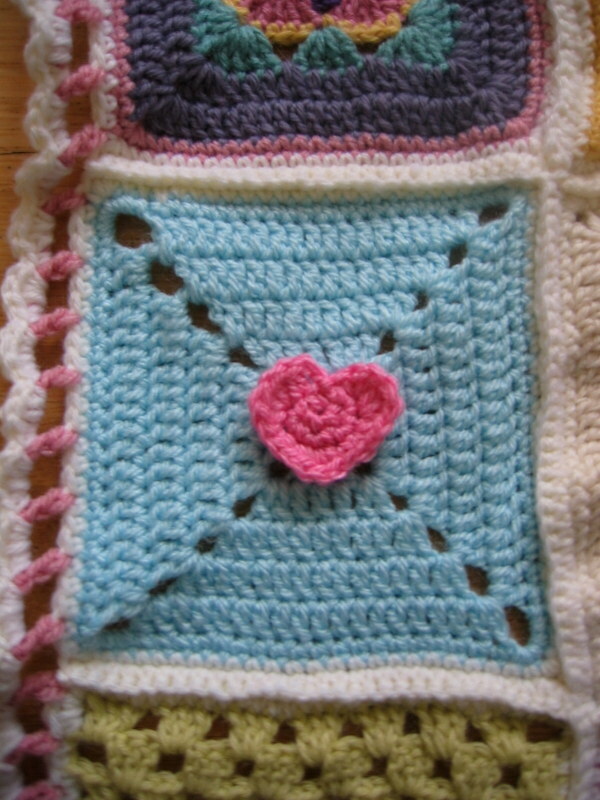 This time I decided to crochet a little heart to go on the square. I think the pastel blue and pink go really well together. The wool was left over from the baby blanket I made before Christmas for a friend but I bought the wool while I was on holiday and when I started this blanket. I’d done this before in different colours but wanted to see what it looked like in one colour. 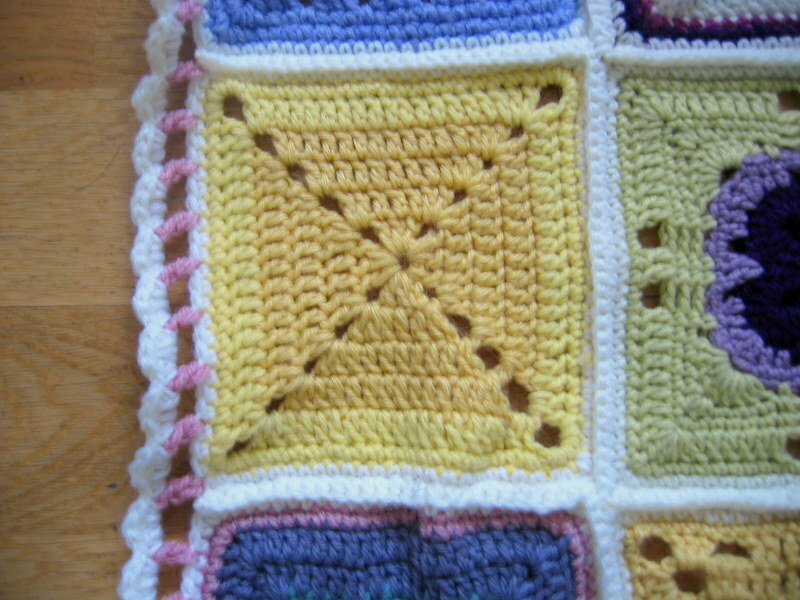 I also felt that the blanket needed a block coloured square to tie it together. 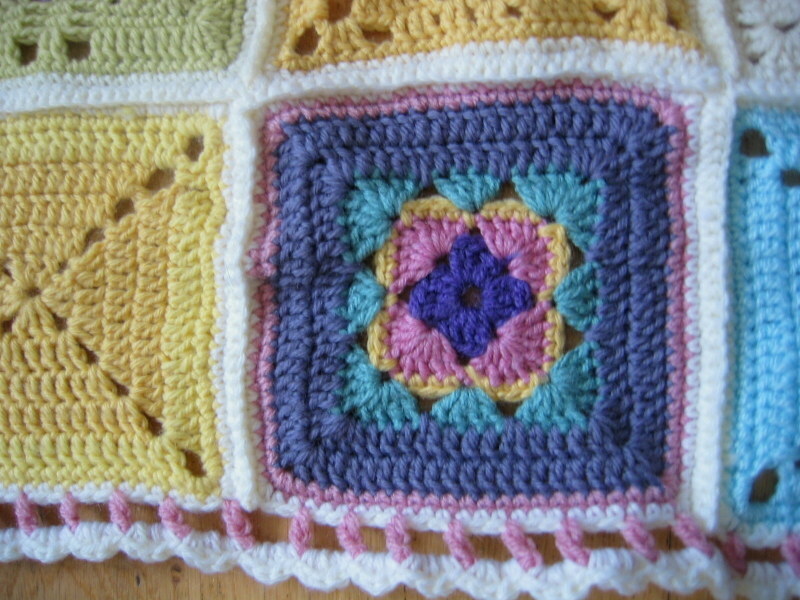 This is another square that I made and enjoyed so decided to make another one. I actually lost the pattern to this one so had to work from an existing square. It was good for me to work it out and not just follow a pattern. 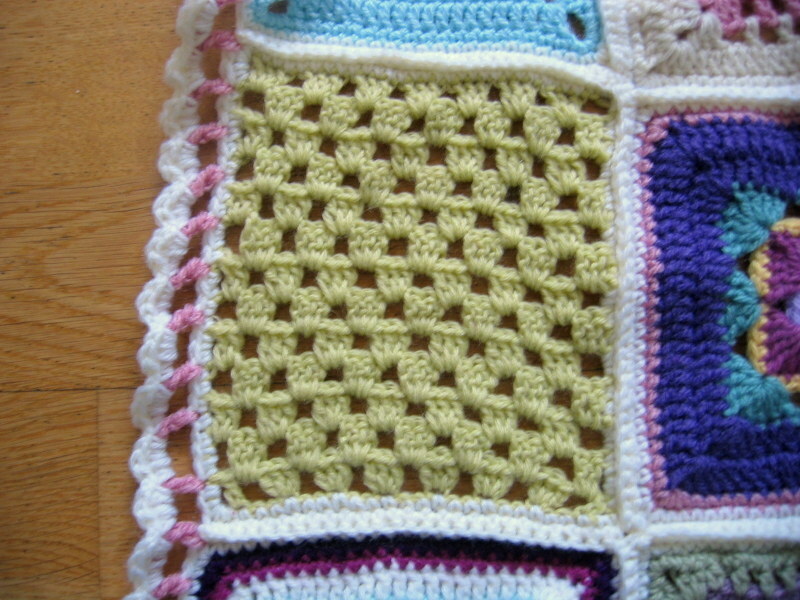 I feel I understand crochet more than knitting and it’s given me the confidence to work out my own squares. Here’s the final blanket. I’m really proud of it. Every square has a story behind it and it’s lovely for me to look back at it and remember the inspiration behind each square. I’ve even kept in a couple that I did when I was starting to feel sick (where the colours don’t quite fit). I won’t ask you which squares you think they are! I crocheted a white round in dc on each square and then dc them together. 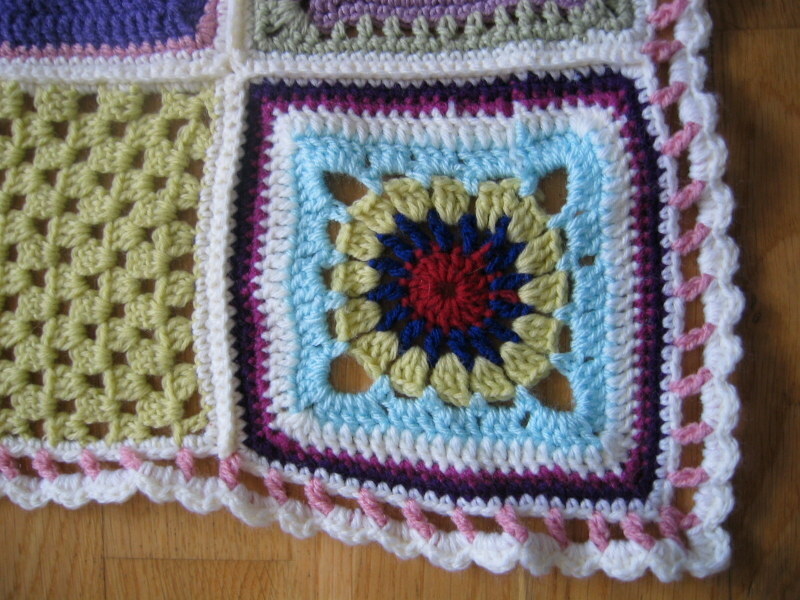 I felt that it needed a border but it had to be quite ‘light’ as anything else would detract from the blanket itself. The border is simply 1 treble, *ch 3 (missing 3 dc from previous round – which is actually the white border I did around each square), treble 1*. Repeat from *to* except in each corner where you treble 1, ch 3, treble 1 into the corner dc from previous round; until you get back to the beginning. I did it in pink and then changed to white to *dc, half treble, treble, half treble, dc* into each 3 chain space from previous round (repeat *to* in each 3 chain space until you get back to the beginning). I know it’s not the best looking blanket in the world but I love it. It’s a great lap blanket too and has already wrapped little man up in the car on quite a few cold journey’s. This is fab! 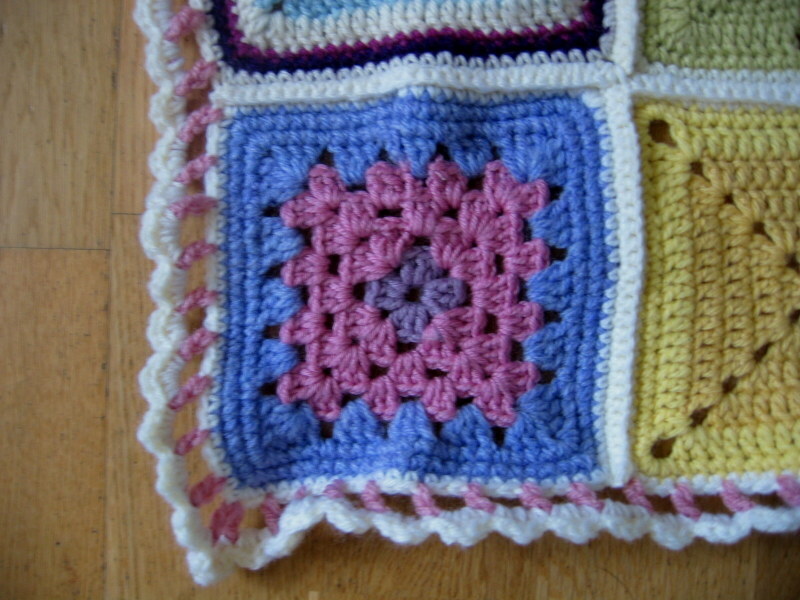 I’ve just started a granny square blanket to learn crochet – I doubt it will be as good as yours though! It’s beautiful, I love the pastel colours you chose. I was very encouraged to read above that you have only been crocheting for a year. It’s something I’d love to learn so there’s hope for me yet! Thanks. You should try crocheting! For ages I thought I wouldn’t be able to do it (people had told me you can either knit or crochet). I tried but couldn’t get the hang of it. Once I got over the fear though, I managed it and found out that I loved it! Once you can the hang of it, the sky’s the limit!